Laminate flooring is a product of multi-layer synthetic flooring manufactured from the wooden composite base and wood grain on its top which appears as a real hardwood floor. Since it is not made from the real wood or wood veneers, this makes it cheap as compared to solid or engineered wood. Potential customers are advised to seek such commercial flooring services from certified suppliers. The flooring is simple to install since it is designed with the mind of the DIY meaning majority of homeowners can install it by themselves. The flooring is sold in the form of planks which just slot together over the foam layer and then glued before laying them directly on the floor. The laminate flooring usually simulates wood and at times stone with its appliqué layer of photographic beneath the plain protective layer. The inside core layer is often made of fiberboard and melamine resin materials. 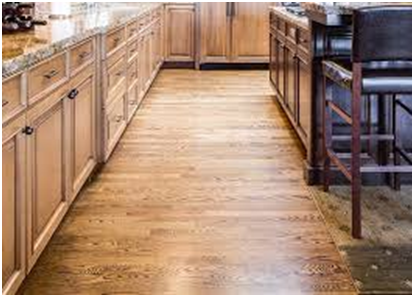 This flooring has grown dramatically in popularity most probably due to its simple task to install and maintain as compared to other traditional surfaces like hardwood flooring. Also, it has the benefits of minimal cost and needs less skill during installation. The flooring is considerably hygienic, durable and a bit simple to sustain. However, it has the weakness of being composed of plastic (melamine resin) which is gotten from formaldehyde. Since it is often made for light domestic utilization, it can be less durable compared to conventional flooring. It has just a lifetime of fewer than five years in heavy domestic use. With its easy installation procedure, an average-sized room can be changed within a single weekend with fewer efforts and skills. Also, it is trouble-free to take care of and convenient for use in high-traffic areas. It has amazing convincing real-wood appearance hence most people would not tell the difference. With its appealing price-tag and simple installation task, it is good for anyone who needs revamping or renovation of their home. Decorating and design communities have welcomed the laminate flooring due to its limitless design capabilities. Indeed, currently, it is a medium in itself. Its varieties of innovative and rich products designs form an atmosphere of complex beauty besides its long-term durability. This versatility mixed with the host of several other advantages makes the floor to be one of the most common and affordable alternatives for renovators and homeowners today. It is crucial to keep the floor clean since dirt, dust and sand particles can scratch its surface with time in high traffic places. Also, keeping it considerably dry, ensures water or moisture does not cause swelling or warping among others activities on the planks even though some brands come with water-resistant coatings. Any water spills are not a threat if they are wiped immediately. Adhesive felt pads are usually located on the feet of furniture to prevent them from scratching the floor. Inferior glueless floors can be separated slowly forming visible gaps within the planks. But it is crucial to rejoin the planks back with the use of correct tools to avoid noticeable gaps. Else, dirt can cover the gaps making it a challenge to close them afterward.